Happy Memorial Day, Everyone!! The table I created today can be used for these next few holidays: today, for Memorial Day, June 14th for Flag Day and July 4th for the Fourth of July. I enjoyed putting it together, and spent the beginning of this week checking out Tuesday Morning to see what would work for my table, without breaking the bank! I started with a red checked vinyl tablecloth that I found at Big Lots. I don't generally use vinyl cloths inside the house (usually they're for use outside on the picnic table!) but I wanted this dinner to be informal, and thought the tablecloth would reflect this. I added a navy blue placemat for contrast and as a base for my dish stack. I found these square paper plates at Big Lots and absolutely loved the pattern, so I decided to use them for the celebration. Memorial Day dinner fare is usually B-B-Q tri-tip, hamburgers or hot dogs, potato and fruit salad, corn-on-the-cob, baked beans and garlic toast; so a bit of informality with paper plates is appropriate. I found these red, white and blue salad plates decorated with an anchor while at Tuesday Morning. I actually saw them one day, rejected them as not a necessity, thought about them all night, then went back the next day and was relieved to still find them there! Has that ever happened to any of you? I figure I can use them for these summer tables and maybe even a nautical table I have been thinking about (I collect lighthouses and nautical items!) They are labeled cmg: handmade in Portugal. My place setting is completed with red goblets from Home Goods, and plastic plaid tumblers from Ross. The flatware is from WalMart. My red-checkered napkins have been in my linen collection for some time now. I also added a white bread-and-butter plate that is unmarked and found as a set of four on an antiquing hunt. The knife spreaders were a find at Tuesday Morning. I'm quite pleased with their quality and detail of decoration. There are four different patterns. My centerpiece started with a basket platter that I found at Home Goods. It came with the red gingham ribbon, but I figure I can weave other colors of ribbon depending upon my table design. Right now, the red gingham works well! I found the patriotic pitcher in Tuesday Morning and it is sitting in a pie plate that was gifted to me by a dear friend. I love the fact that a recipe for apple pie decorates the bottom of the plate! Ceramic salt and pepper shakers and faux flowers from Michael's as well as weighted star-burst decorations festooned with small American flags from Michael's complete the centerpiece for my Memorial Day table. I love the colors of red, white and blue together, and their brightness really accentuates that this table will be for a special family dinner to honor the brave men and women of our armed forces who spend their lives making sure our freedom is safe, and to remember those who have perished in the service of our country to insure the Stars and Stripes of our Flag will Forever fly over our precious land as a symbol of its strength and pride. Thank you, Ladies, for hosting these fun parties! Thank you in advance for your kind comments. Your encouragement is so appreciated! Yes, I have thought about plates overnight and then gone back. Great table, with fun finds. I like all of it, but the anchor plate, pitcher and bread plates with spreader are my favs. I so adore this wonderful tablescape!! A touch of the heart of America!! I love Americana and your table is wonderful! I will start pulling my décor out this week. Once June is here I am so ready! P.S. Your blog should be wider to accommodate your larger photos...just a little tip. I saw those salad plates at Tuesday Morning (LOVE that place! ), but they only had 2. I passed. Wish I hadn't. They would still have been useful for something, I'm sure. Or I could have run around town and hit up the other 3 Tuesday Mornings, I guess. Rats! Oh, well. I love yours! I'm a big sucker for anchors!!! I like the idea of using the vinyl tablecloth indoors. It really does help to convey the casual picnic feel! You did a really terrific job with this table! I hope your Memorial Day weekend was a good one, and I wish you a great rest of the week! Very cute. I'm wanting to do a nautical July 4th so I'm going to have to go check Tuesday Morning. I came over from a comment you left on my blog, and so glad because your table inspired me! I love that you mixed paper plates and "real" plates. Your centerpiece is wonderful. I need to think about layering more like that, terrific idea. Count me as your newest follower, Rosie. We share a love for dishes, and this table setting you've made here is very cute! Rosie, this table is so festive! I love all the special touches and how you coordinated everything so well. Love this table....glad your bought the plates. Perfect! What a beautiful memorial day table you set. I just found your blog, so I am your newest follower. summers we always had as my kids were growing up.........just easy yet quite nice. Enjoy that pretty table. Loved all those adorable lil spreaders too. So cute! 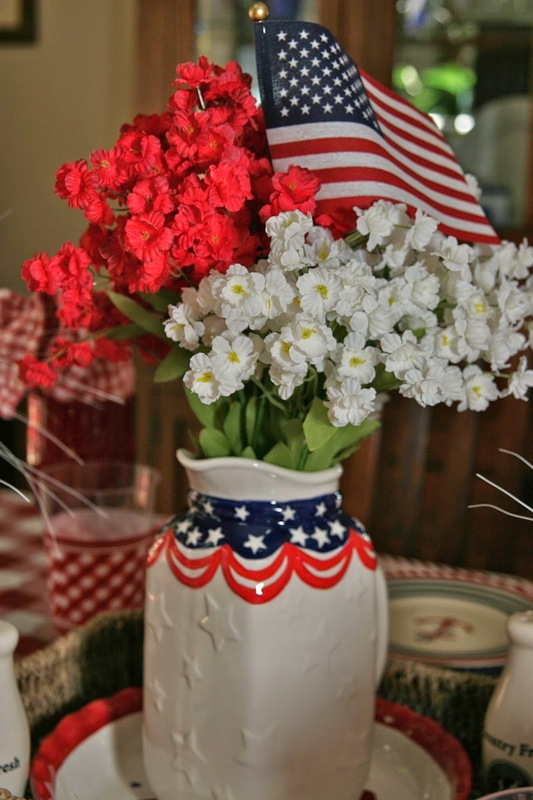 I love the patriotic theme of your tablescape!!! Hurray for the Red, White and Blue. . .
and for your great "find" patriotic paper plates!!! I enjoy finding paper plates that reflect a theme such as yours!!! Thank you for your sweet comment and visit!! !